Motorola and Verizon have officially announced the launch of new highly-anticipated Motorola XOOM Google Android 3.0 Honeycomb-based tablet, which is awarded as “Best of Show” winner at CES 2011. According to Verizon, the 10.1-inch XOOM tablet can be upgradeable to 4G LTE in Q2 2011 without additional costs. In an effort to deliver the world’s first true tablet experience, Motorola XOOM is comes equipped with a speedy 1 GHz dual-core processor, vibrant 10.1″ wide HD touchscreen, dual camera (5MP plus 2MP front-facing camera) and newest Android 3.0 operating system with Adobe Flash Player support. 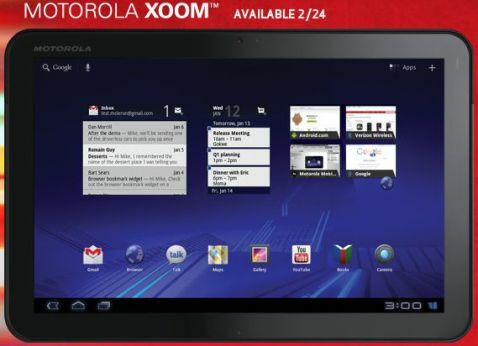 The new sleek Motorola XOOM Android 3.0 tablet will hit Verizon stores beginning February 24 for $599.99 on a new 2-year service agreement, or priced at $799.99 without a service contract. In addition, the 3G data service for Motorola XOOM is starting at $20 per month for 1GB mobile data access. A WiFi-only Motorola XOOM has also been made available at price of $599.